Although the easiest place to go on a nature walk seems to be the local park, stay away from any areas filled with people or playground equipment. Both will distract your child from the main purpose of the walk, which is enjoying the natural world. Even in heavily populated places, there are natural areas that you may not see until you start looking for them – sometimes along a side street you drive on every day. Choose your location wisely, and scout it out beforehand, if possible. There are several ways to help your child learn to look more closely at nature. First, encourage young children to use a magnifying glass to get a closer look at anything that interests them. In addition, it is important to explain to children that they can use many senses to experience nature – not just vision. Have them not just look at the bark of a tree, but smell it and feel it. Sit for a few moments in silence, listen to the natural sounds around you, and try to describe or identify them. Hands on activities such as making tree rubbings or collecting fall leaves will also interest younger children. Books on local objects in nature, such as leaves, birds, or insects, can be easily found at most public libraries. Bring one along, and help your child identify the different natural objects that you see. You never know – you might learn something new, too! Put together a scavenger hunt for your child to do as you walk. Included in the hunt can be descriptions like “something soft," “something pink," or “something bigger than a house." Alternatively, you can encourage a younger child to find as many objects as possible in different colors. 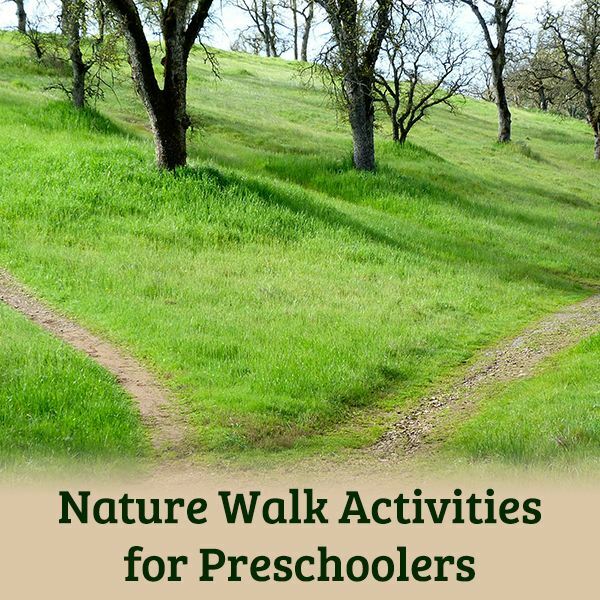 Because this activity might take away from your child’s ability to truly investigate what she finds, it should be used only if previous nature walks have been unsuccessful because of their lack of structure. You can also try some other fun nature games with your child. On the walk, encourage children to collect bits of nature that interest them, such as tree bark, flowers, pebbles, or leaves. You may wish to make the rule that they can only take along objects that will fit in their collection bags, or that they must check with you to make sure that the objects they are taking along are safe. When you get home, suggest that they safe their finds by placing them on one piece of contact paper and covering them with another. Alternatively, they can glue their finds to a piece of heavy cardboard as a collage or make other fun nature crafts with them. Some children may decide to keep their finds intact, in which case you may want to suggest keeping them in the collection bag on a porch or similar area. Make sure that children know to stay away from poisonous mushrooms, berries, or plants. Instruct children to stay next to you or with the group at all times. Keep an eye out for sharp objects, such as thorns or broken glass, and make sure to steer children clear of them. Warn children about the dangers of touching animals.